Reenacting WWII has come a long way since its origins in 1975. Back then, it wasn't "cool" to cut your hair short or even to wear military uniforms. However, there were groups of guys who wanted to understand what it was actually like, to really be in WWII. They rejected the "Hogan's Heroes" view of the war -- instead, doing research, interviewing veteran's -- it was a hard row to hoe and there were many pitfalls and false starts. 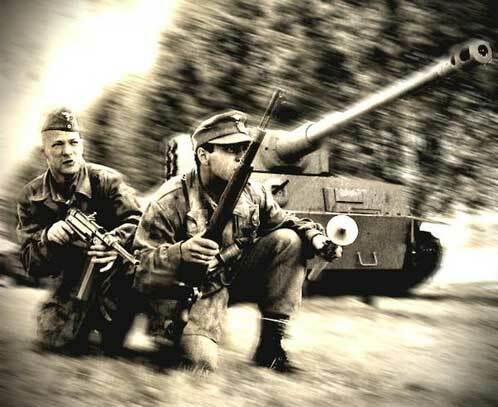 Now, almost 30 years later, WWII is going well and strong, gaining momentum every event. Unlike Civil War or Rev War, WWII is not done for the crowds, so there isn't this "built-in" base of people who know about it, AND... we have to pay our own way, we don't get free food, ammo and t-shirts nor are we paid to come to events -- there is no large spectator base to pay for this. We have to pay our own way, but then again, we are free to do it OUR way! Now THIS is a great WWII Video! Sure you don't wanna, maybe do WWII? WWII Articles stuff has been separated into a new page, also appearing in the menu bar! If you find a problem in this time/area or would like your unit listed please feel free to e-mail the WW2 T/A webmasters: Harry Coombs, Rob Haught or Tom Planinshek. Hey, we're gonna keep the lights on! Through the kind help of our friends, reenactor .Net has moved to a new server! And... we will be able to continue the stuff we do ;-) To all who helped out, THANK YOU!!! Last, please, visit the reenactor.Net honor wall... this is a page that lists those who have donated money to help keep "the lights on" here on r.Net. If you would like to help out and donate, please click here. Militaria Magazine -- One of the very best publications World-WIDE, Militaria specializes in... Militaria! Every magazine is chock full of colour photos of uniforms and kit along with with excellent high quality articles explaining everything. Militaria covers everything to do with the military and militaria during the 20th Century. NO reenactor should be without Militaria -- Get a subscription today.